The Lache Community Centre Rhino has had a face lift thanks to budding young designer Romy Redston. ‘African Rhino’ was originally part of the Chester Rhino Mania public art trail in 2010. One of 62 decorated sculptures that was sold at auction after the art trail ended and spent seven years at Liverpool John Lennon Airport. Last year Liverpool Airport kindly gifted the rhino to the Lache Community. 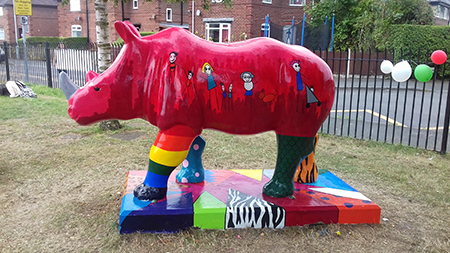 Originally painted by Cheshire artist Mike Kilkelly as a tiger, the rhino has now had a total face lift following a competition with local school children. 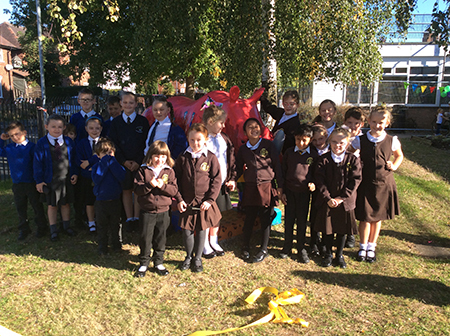 Said Councillor Louise Gittins, Cabinet Member Communities and Wellbeing: “We thought this would be a great opportunity to give the rhino a new coat. 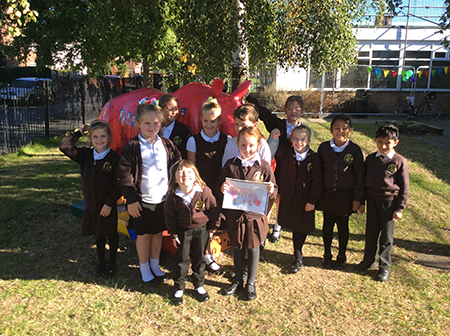 We worked with the two local primary schools, Lache Primary and St Clare’s Catholic Primary to hold a design competition with the children, the winning design being brought to life on the rhino by local artist, Lucy Elizabeth Jones , who was part of the original art team for Rhino Mania. 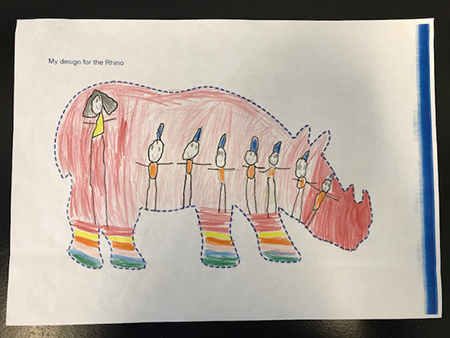 Mrs Marian Ryder, St Clare’s Catholic Primary School said: “Pupils in St Clare’s were delighted when they were invited to design a new skin for the ‘community rhino’. There were lots of excellent entries and after viewing all the wonderful, artistic pieces, the judges decided that Romy’s design was the one.